Blackmagic Micro Cinema Camera, a miniaturized Super 16mm professional digital film camera with a revolutionary new expansion port that lets users use PWM and S.Bus model airplane remote controls to operate the camera wirelessly for capturing action anywhere. Unlike regular cameras designed for hand held shooting the Blackmagic Micro Cinema Camera can be mounted in cars on walls and then controlled directly from buttons positioned on the front of the camera itself. This means customers don’t need to reach around the back of the camera to start recording, and the front mounted tally LED allows easy confirmation that the camera has started recording. The miniaturized design of the Blackmagic Micro Cinema Camera features a body that is not much larger than the Micro Four Thirds lens mount, making it as small as a camera with a professional lens can be. Its core is made out of a lightweight and strong magnesium alloy so it’s durable enough to use anywhere, from the ocean floor to the stratosphere or beyond. The Blackmagic Micro Cinema Camera is perfect for use on quadcopters, as a crash cam, or even hidden on set for reality TV. It’s small enough to be used anywhere, like on a skate board for spectacular extreme sports shots, mounted to a drone for recording panoramic fly overs, or even strapped to a helmet for amazing point of view shots. The Blackmagic Micro Cinema Camera is the digital film camera for action shots. High resolution 1080 HD, 13 stops of dynamic range. Switchable 60 fps rolling shutter or 30 fps global shutter. 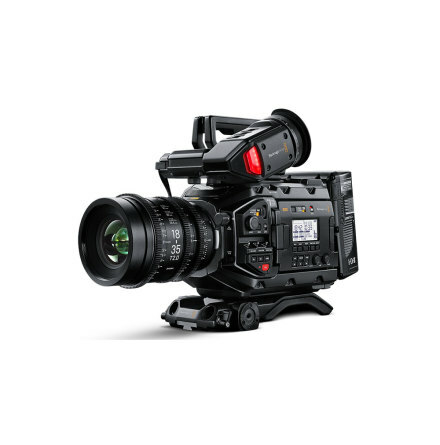 Built in 12-bit RAW and ProRes recording and captures true digital film quality images. Active Micro Four Thirds lens mount. Easily adaptable to other lens mounts. Expansion port with a DB-HD15 connector and breakout cable. Remote camera management, using the expansion port to remotely start and stop recording, adjust focus, change the iris and also connect to video transmitters to monitor recording status, battery life and audio levels. HDMI connector for monitoring video output on any monitor or TV. SD card slot for recording to high speed and low cost SD card media. 3.5mm stereo input for connecting external microphones or to other line level devices.